You can’t really bring up a block stacking puzzle game without Tetris; if you show a game with blocks to someone, probably one of the first questions they’ll ask is, “So how is this like Tetris?” And that’s perfectly fair! After all, the influence Tetris had on the world is something that really can’t be ignored. It was a huge hit at the time of its release, perhaps because of how simple it was to get into: line up blocks horizontally and clear a line, until you lose through means of the speed getting too much for you to handle. To many people, this was addictive. The vaguely Russian-sounding jingle that played during the whole affair was catchy, there wasn’t any artificial difficulty, it was easy to get into, and so on. Unsurprisingly, the game got immensely popular, and like any popular game, other companies tried to cash in on the craze. Thanks to the success of Tetris, games like Dr. Mario and Columns appeared. One of these iterations on the concept of stacking falling pieces was Puyo Puyo, from the Japanese company Compile, or more specifically, a man named Masamitsu Niitani. Prior to Puyo Puyo, Compile had been mostly known for shoot-em-ups; series such as Zanac or Aleste were quite well-received at the time. 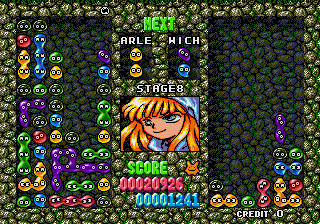 However, they struck it big in 1991 with the release of Puyo Puyo, a small puzzle game that’s actually pretty different from Tetris in many ways. The premise of the Puyo Puyo series as a whole is just as simple as Tetris. Connect four or more Puyo (colored blobs) of the same color and they disappear. When that happens, any Puyo on top of them fall down. Unlike Tetris, gravity is applied to every single Puyo, which means it’s impossible to have any gaps in between your lines. Although this might seem easy at first, there are many elements designed to make your game time much more difficult. The “pieces” here aren’t as different between themselves as the ones in Tetris, however. 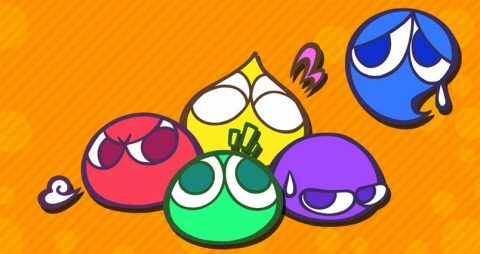 While Puyo fall in groups of two at a time no matter what (at least in the earlier games), they come in a variety of different colors. Because there can be many colors at a given time, it can sometimes be a little difficult to match a group together. Just like Tetris, in the marathon modes the Puyo just fall faster and faster until you can’t keep up with the speed and get a game over. Even though the area that has to be kept clear is smaller than Tetris (one space wide), that doesn’t make the game any easier of an affair, especially when you have to keep track of a variety of colors at once if you want any hope of continuing. What really makes the game stand out, however, is its engaging competitive aspect, which focuses on the art of chaining. By itself, clearing a single group of Puyo doesn’t have much of an effect. If you make it so that upon clearing a group of Puyo, the ones on top of it fall so that four or more connect again, though, these are counted into a chain, which makes the opponent’s life much more difficult. Getting a chain means you send “Nuisance Puyo” to your opponent’s side, which are transparent Puyo that can’t be cleared by grouping them together; the only way to get rid of them is by clearing Puyo adjacent to them. The more chains you get, the more Nuisance Puyo you send over to your opponent – depending on the length of the chain, up to five rows of Nuisance Puyo can drop on the opponent’s screen at once. This is where the game really shows its complexity, and outshines Tetris in the eyes of many that pick up Puyo Puyo. In the later competitive modes of Tetris, you don’t actually have a way to outright block your opponent from completing their task, since clearing a line means shoving a line under your opponent’s screen, instead of on top. These lines always have one block empty that allow you to clear the line if you place a piece there, so instead of being a hindrance, this could actually help your opponent. In Puyo Puyo, on the other hand, you have to ask yourself several questions while playing: “Can I create a large chain faster than my opponent? If I give up my hopes of making a huge chain right now and just send over my smaller chain, can I disrupt my opponent’s setup by giving him too many Nuisance Puyo? Is my opponent’s chain something I can’t work around?” All of those questions and more have to be kept in mind and answered every step of the game. Adding to the panic, Nuisance Puyo are only dropped onto your opponent’s screen after you finish your entire chain. Since longer chains usually take a bit to clear themselves and you can’t act while they do so, this means that your opponent can use that time to build up a chain that surpasses yours while your Puyo are still falling into their place. Unlike the later versions of Tetris, you can’t hold pieces, so there’s no saving that super important combination to get yourself out of a tough spot. For these reasons, the competitive aspect of Puyo Puyo is one of the places where the series really gets most of its attention from. This has been the case throughout every entry in the series, aside from some single player focused spinoffs, and is improved upon more and more with each game with new modes of play. Compile has also held various tournaments in order to garner attention for the series, and just like the games themselves, they’re really fun to watch. 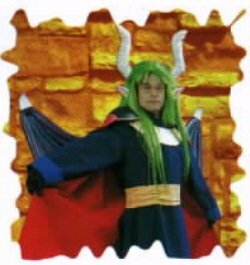 Another unique feature of Puyo Puyo is that the game actually has characters. Many of these are from a series of PC dungeon crawlers, also by Compile, called Madou Monogatari. Many of them are simply minor enemies in those games, and thus there have little to no dialog. 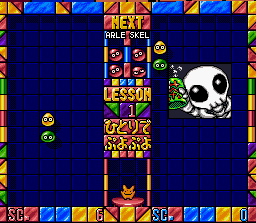 In Puyo Puyo, however, Compile uses the opportunity to flesh many of them out, giving them unique characteristics. The series never really has a serious story or dedicates much time to elaborating upon it, featuring rather simplistic plotlines. While that may sound like a weak point, it actually turns out to be a testament to how well Compile designed the characters and dialog, as they leave a memorable impact on the player with relatively few lines dedicated to them in each game. Pretty much every character has a unique quirk, and thanks to the upbeat tone of the games, you’ll be quite engaged by all of them. 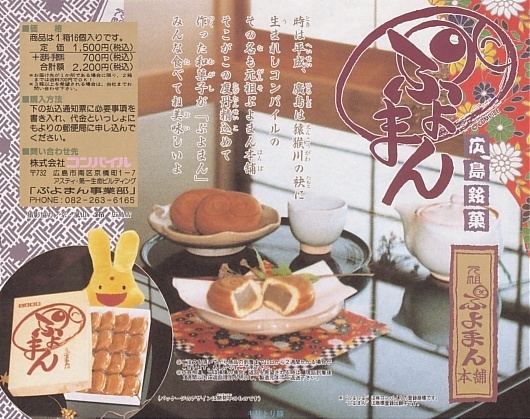 Puyo Puyo is absolutely huge over in Japan, and many consider it to be a serious rival to Tetris. The franchise completely transformed Compile’s profile, who subsequently made most of its money through merchandising from this series, even after the property was passed on to Sega. It took a while in order for Puyo Puyo to gain many of the gimmicks it is now famous for, but the series as a whole is rather addicting, and perhaps a bit more rewarding than Tetris if you play it long enough. If you’re interested in a fresh puzzle game experience, this is one series is one you definitely don’t want to pass up.